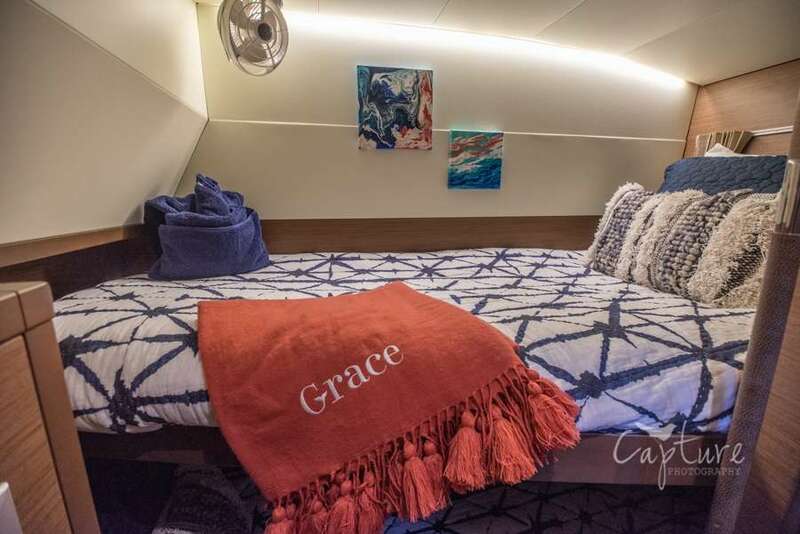 “GRACE” is a brand new 2020 Lagoon 520 debuting at the St. Thomas Boat Show in Fall 2019, and is available for charter in the Virgin Islands upon splash down in November 2019.This newly designed 52’ Performance Luxury Model Lagoon is appointed with Beautiful Modern Comforts and Capabilities reflected in her “5 Private Bedroom Staterooms & 5 Private Bathroom Floorplan”. Whether you’re traveling with a group of friends, family, or just want to have her to yourself, she will accommodate! 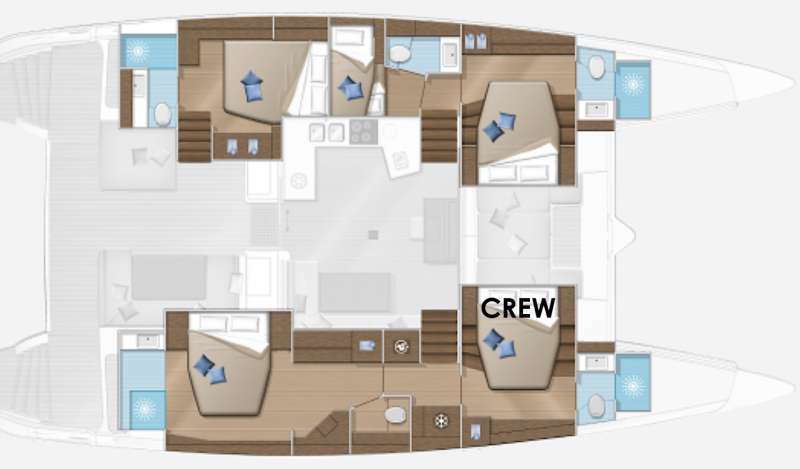 The Possibilities are Endless on “Grace”.Tremendous Entertaining and Relaxing Areas are on Board as well! 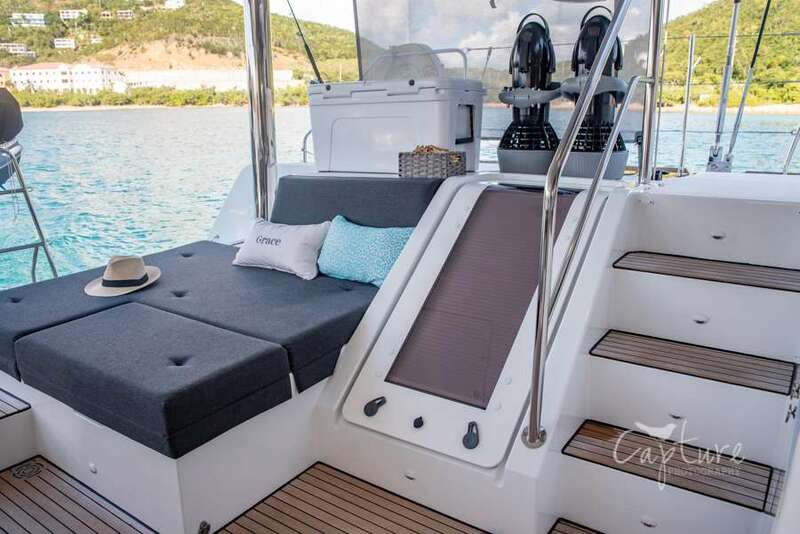 Grace’s view from The Flybridge is Unsurpassed. As our Captain steers you to Blue Horizons, enjoy the view from Grace’s Enormous Convertible Settee! One of the Best Seats in the House! Or Enjoy the Sunrise while Sipping your Coffee in the Forward Cockpit Lounge & Trampoline Area. 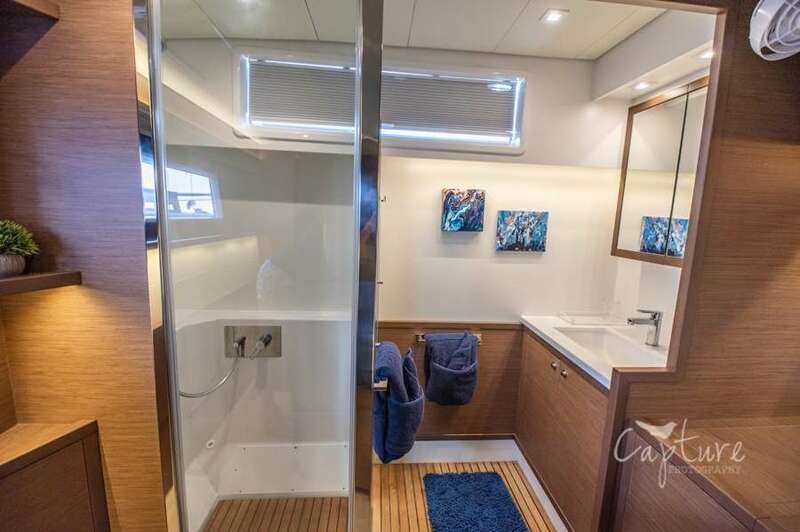 Although your Favorite Place may be The Aft Cockpit where the Exquisite Gourmet Cuisine will be served. 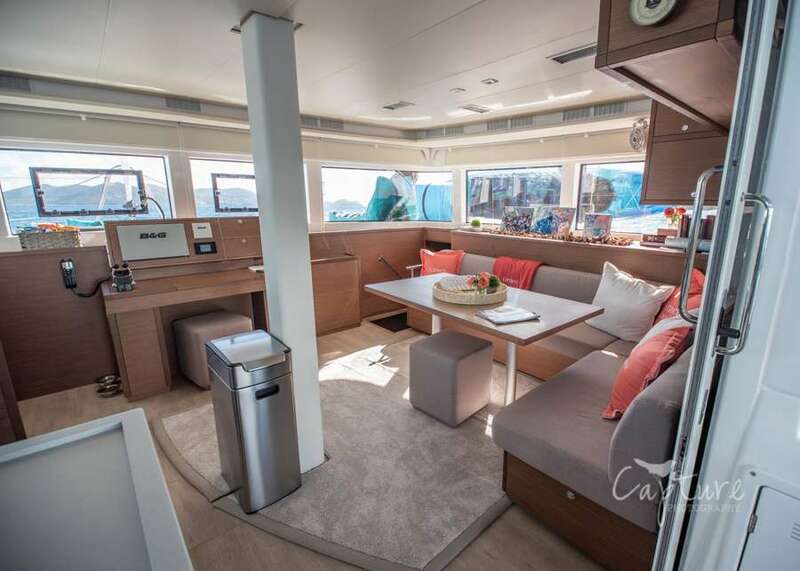 The Main Salon has an Open Concept Galley featuring Kitchen & Bar with Table, Large Sofa-Chaise Seating and the TV/Entertainment System & Apple TV. Fully Appointed FUN is available at your fingertips including: 2 Paddle Boards, Tandem Kayak, Large Floating Pad Island, Snorkel Gear, Beach Towels, Coral Safe Sunscreen and Scuba Tanks upon Request for Dive Excursions.Grace’s Luxury Accommodations enhanced with Beautiful Functionality is a WIN-WIN for your Amazing Vacation in the Gorgeous Virgin Islands! She has all the Bells and Whistles for your Enjoyment and Pleasure! We look forward to you being our guest……GRACE AWAITS! Joseph and Britta grew up a world apart but ended up finding each other and true love in the beautiful Virgin Islands. He grew up on a small family farm in the Pacific Northwest and she grew up with her toes in the sand on the white sandy beaches of Florida. Before moving to the Caribbean, Joseph received degrees the Culinary Arts and Patisserie and Baking from Western Culinary Institute in Portland Oregon. In 2009, he packed his bags for the islands where he immediately bought and resided on his new boat in the Virgin Islands. Britta came to St Croix as a PADI dive instructor in 2005. She worked in local dive shops and in the hospitality industry, while taking advantage of the best scuba diving in the Caribbean. She honed in her skills as being one of the premiere dive guides and instructors while living in St Croix. 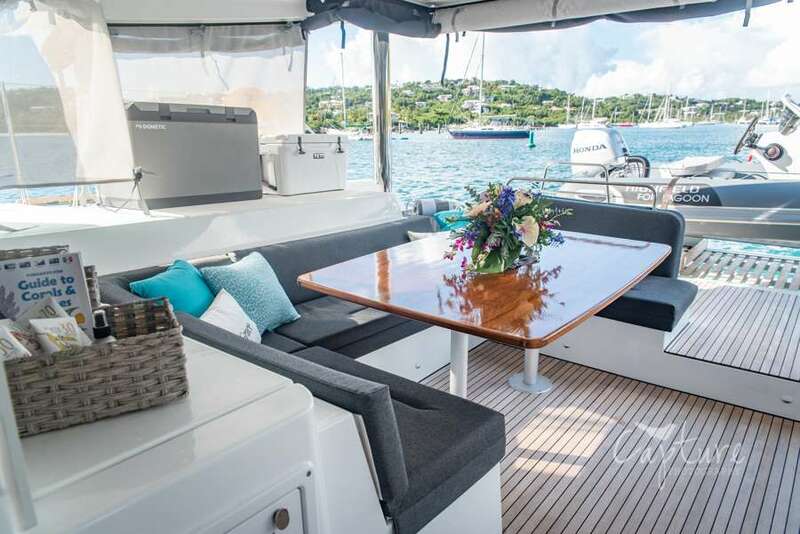 While the couple lived in St John Britta spent time aboard a 36' Pearson- "Kiote" offering day sailing excursions the shallow reefs that fringe the East end of the island. Her love of all things underwater is apparent by her enthusiasm to share her discoveries of animal and plant life while on your water adventures! Whether you're a beginner snorkeler or advanced scuba diver, her knowledge and expertise always delivers an amazing custom designed experience for everyone. 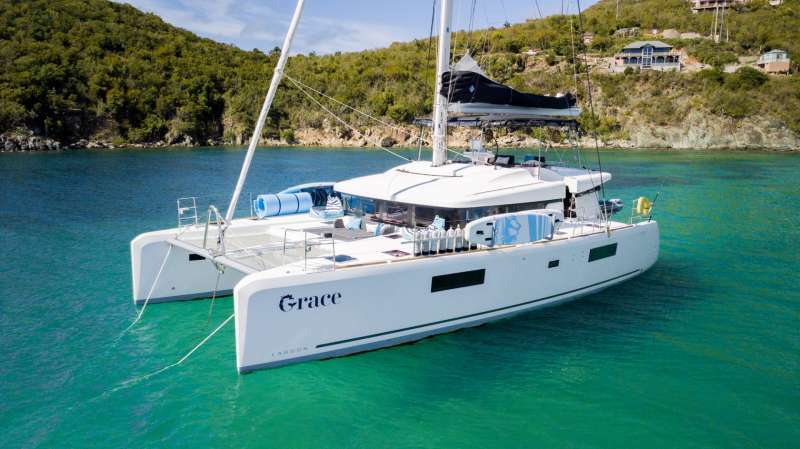 Before embarking on the New Luxury Catamaran "Grace", Joseph and Britta were on the 50ft Catamaran "Dianna Rose" for 3 years and worked in tandem, perfecting a concierge experience with world class cuisine and custom tailored scuba and snorkel adventures for all levels. Proud to partner with the Virgin Island community, Joseph and Britta take a lot of pride in buying local. These key relationships with farmers and fisherman has elevated their status as having the freshest ingredients on board at all times and has been a key to their success. 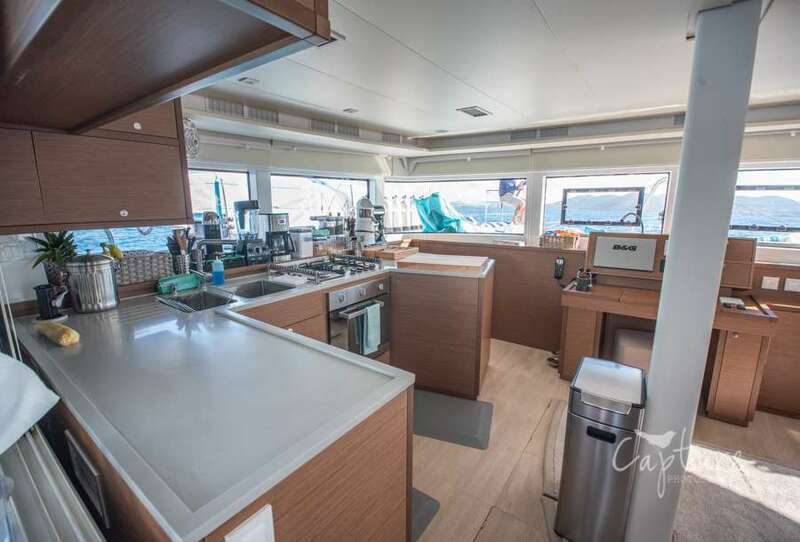 Prior to "Dianna Rose", Joseph spent 5 years aboard 120' Broward Motor Yacht "Freedom" as chef perfecting the art of fine cuisine adapting the premiere culinary French ideology of "Mise en Place" within the luxury yachting experience. 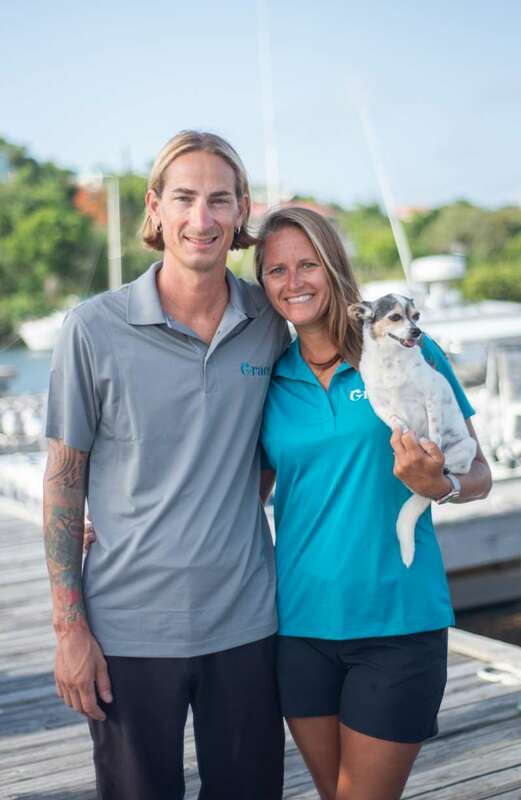 Our extensively trained dynamic duo, Captain/Chef - Joseph and his First Mate/Dive Instructor/Mermaid - Britta are excited to take you away on a beautiful journey aboard "Grace". 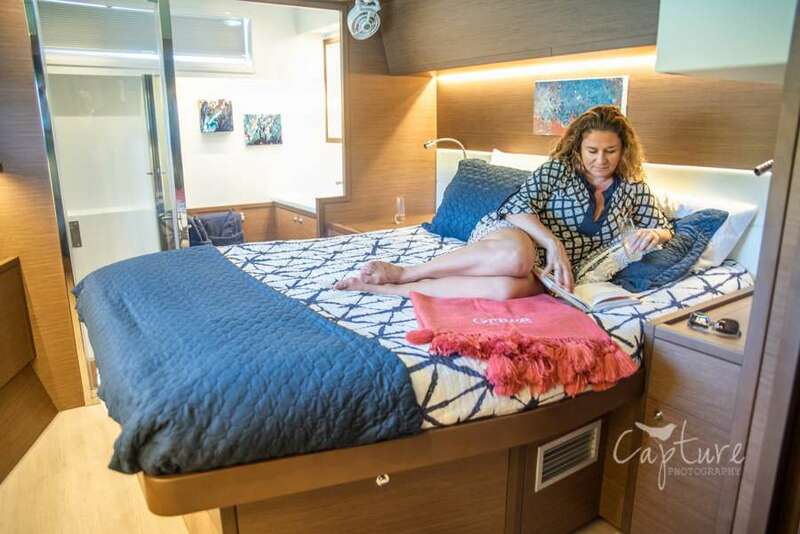 She's a brand new impeccable 2020 52' Lagoon Catamaran and is "The Grand Madame" like no other in the islands. 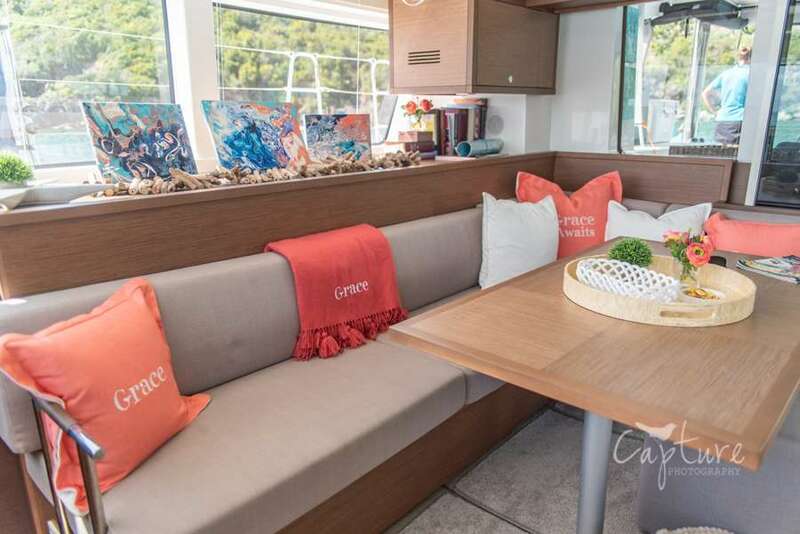 "Grace" is the perfect Trifecta: World Class Sailing in Luxury Accommodations + Superb Cuisine coupled with Incredible Water Adventures while surrounded by the Beautiful Virgin Islands = The Best Luxury Yachting Experience. Grace and her crew will surely Bless you with Memories of a Lifetime. We look forward to you joining us and Sharing a Magical Sunset in the Beautiful Virgin Islands. Grace Awaits! $350 for Referral course. Dive gear included. $125 for 1st discover dive and any additional discover dive is $75. Dive gear included. $400 for advanced course. Dive gear included. $50 per group dive if guided dives by Britta.